Need to improve the organic reaction to your biochemist resume? Focus on your specialties and the results of your work. Get ideas from this sample. If you want to improve the "organic reaction" to your resume, focus on your biochemistry specialty areas and the results of your work, says resume expert Kim Isaacs. This sample resume that she created for a midlevel biochemist can give you some ideas. 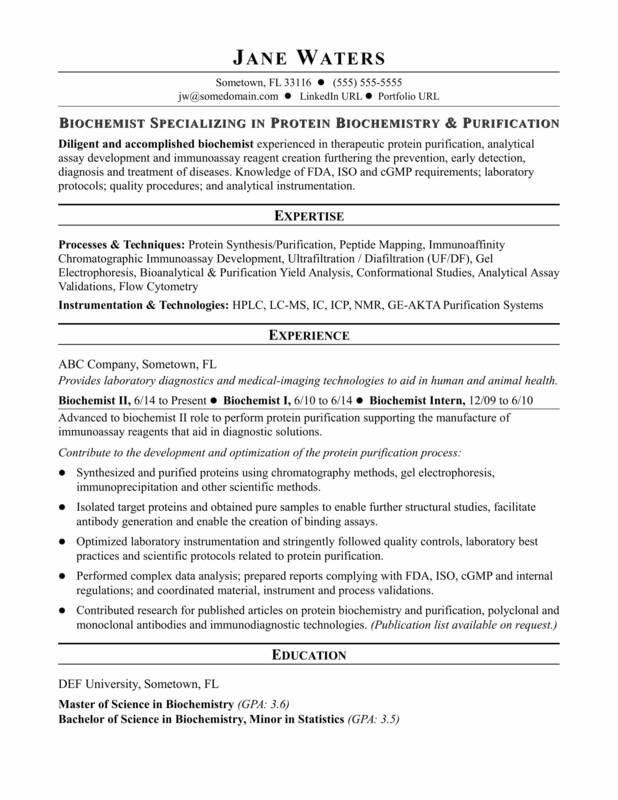 You can view the sample below or download the biochemist resume template in Word. And if you need more help, get a free resume evaluation today from the experts at Monster's Resume Writing Service. Jobs for biochemists are projected to grow by 11% (or 3,600 jobs) from 2016 through 2026, which is faster than average, according to the Bureau of Labor Statistics (BLS). You'll find the highest level of employment for this job in the following states: New Jersey, California, Massachusetts, Texas, and Pennsylvania; and in the following metropolitan areas: Newark, NJ; Boston; New York City; Montgomery County, PA; and San Francisco. As a biochemist, you can expect to earn a median wage of $91,190 per year, or $43.84 per hour, according to the BLS. Additionally, you can learn more about science careers and search for biochemist jobs on Monster. Diligent and accomplished biochemist experienced in therapeutic protein purification, analytical assay development and immunoassay reagent creation furthering the prevention, early detection, diagnosis and treatment of diseases. Knowledge of FDA, ISO and cGMP requirements; laboratory protocols; quality procedures; and analytical instrumentation. Provides laboratory diagnostics and medical-imaging technologies to aid in human and animal health. Advanced to biochemist II role to perform protein purification supporting the manufacture of immunoassay reagents that aid in diagnostic solutions. Synthesized and purified proteins using chromatography methods, gel electrophoresis, immunoprecipitation and other scientific methods. Isolated target proteins and obtained pure samples to enable further structural studies, facilitate antibody generation and enable the creation of binding assays. Optimized laboratory instrumentation and stringently followed quality controls, laboratory best practices and scientific protocols related to protein purification. Performed complex data analysis; prepared reports complying with FDA, ISO, cGMP and internal regulations; and coordinated material, instrument and process validations.